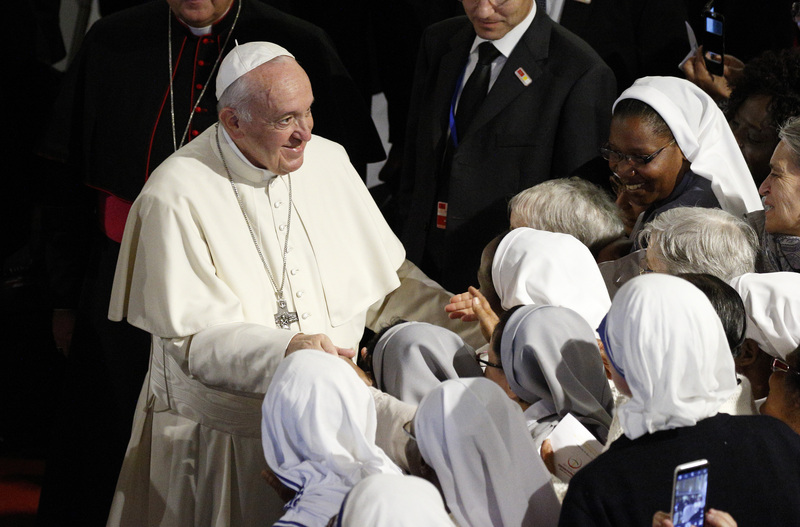 Pope Francis addressed the central question of what it means to be Christian in Morocco and in other Muslim majority countries in the region in a talk in St. Peter’s Cathedral, Rabat, on Sunday morning, March 31. They gave him an enthusiastic and emotional welcome when he arrived in this art-deco style cathedral that was completed in 1921. One woman put a garland of flowers around his neck, as he shook hands and as he walked up the aisle and the congregation applauded. There are around 30,000 Christians (including 23,000 Catholics) in this majority Muslim nation of 35 million people. Next, Sister Mary Donlon, provincial of the Franciscan Missionaries of Mary, spoke on behalf of the 175 women religious who give witness to the love of Christ in this land. She recalled that many are very old and then presented the 97-year old Italian Franciscan sister, Sister Ersilla. She came and kissed Francis and spoke to him. Francis then delivered a talk in Italian that was translated simultaneously into French. In this way, he said, “dialogue becomes prayer” in the name of human fraternity, a “fraternity torn apart by the policies of extremism and division, by systems of unrestrained profit or by hateful ideological tendencies, that manipulate the actions and the future of men and women” as the document he signed in Abu Dhabi on Feb. 4 stated. He encouraged them “to make visible the presence and love of Christ, who for our sake became poor in order to enrich us by his poverty, and continue to be neighbors to those who are often left behind, the little ones and the poor, prisoners and migrants.” He prayed that by their charity they may be “a path of communion between Christians of every confession present in Morocco.” He encouraged them to show this charity to “the vulnerable” in society and in this way “to build of a culture of encounter” and also to continue in the work of education. He ended, as he always does, by asking them to pray for him. And then, four children surprised him by coming up to the table. He responded by giving each a gift of a rosary, as the congregation broke into sustained applause. Interesting and here in my City Muslims are trying to convince Christians why they are important.